The most productive day was the 18th, when there were further signs of spring. An influx of Thrushes to Holland gardens saw a total of 92 Fieldfares, 80 Redwings, 30 Blackbirds and 3 Song Thrushes recorded and better still were 2 Siskins at Greenwall-only the 2nd February and 3rd winter record for the isle. 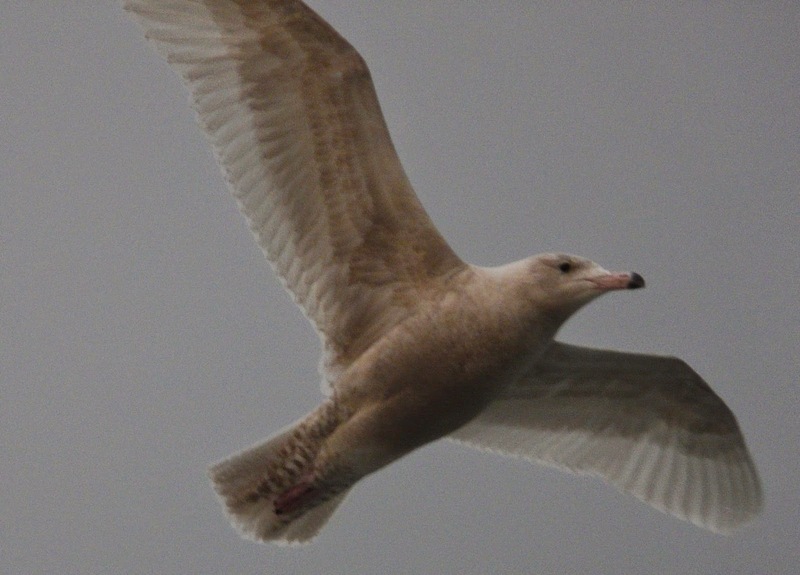 A Lesser-blacked backed Gull was off Hooking the same day while the 2 Glaucous Gulls were seen from time to time with both birds noted on 20th. 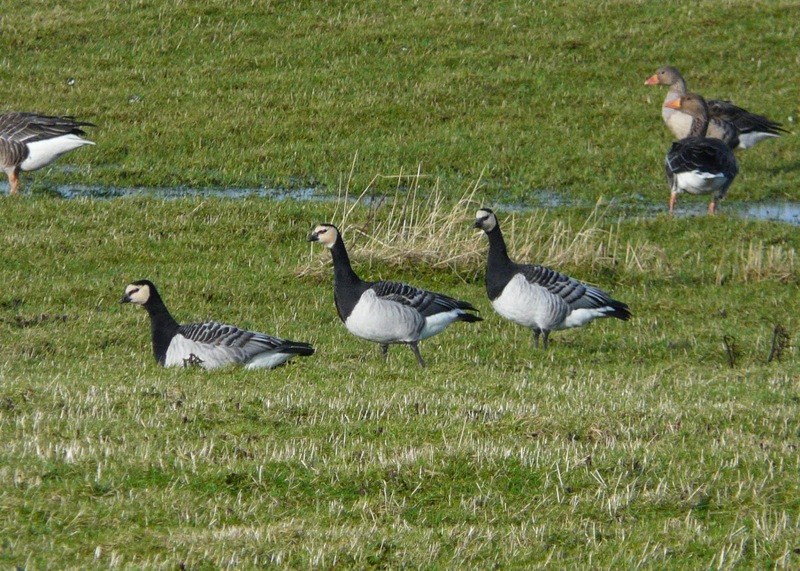 Otherwise it's been more of the same with the Green-winged Teal still at Gretchen (19th and 20th), the Tundra Bean Goose by the school (18th), the Greenland White-fronted Goose near the airfield (18th and 22nd) with 2 Pink-footed Geese and the 7 Barnacle Geese also still present. A few Black-headed Gulls are now being seen daily (5 on 20th), the Grey Plover and 1 of the Woodpigeons remain along with a Chaffinch, 30 Twite and 42 Snow Buntings (all 22nd). Nothing major to report from a glorious 14th (Valentines Day and all that!) 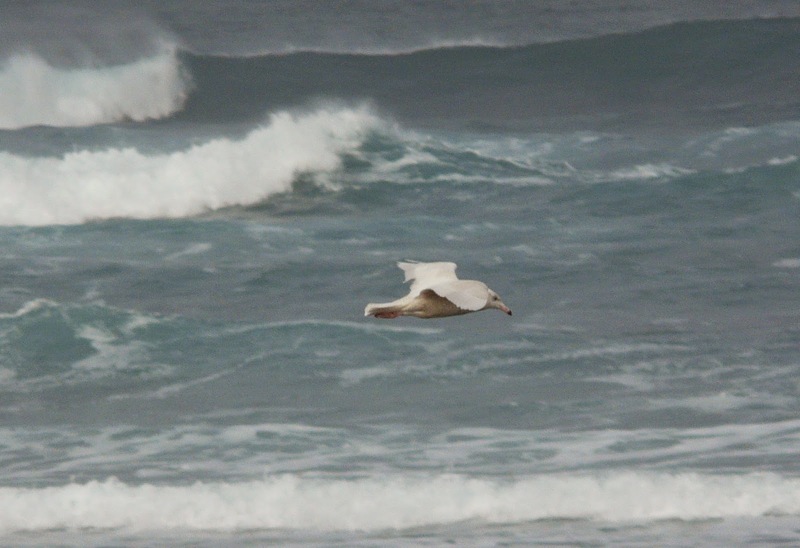 while a seriously windy 15th saw only the second Iceland Gull of the year, a 3rd winter sheltering at Bewan Loch with the 2 Glaucous Gulls also still present. 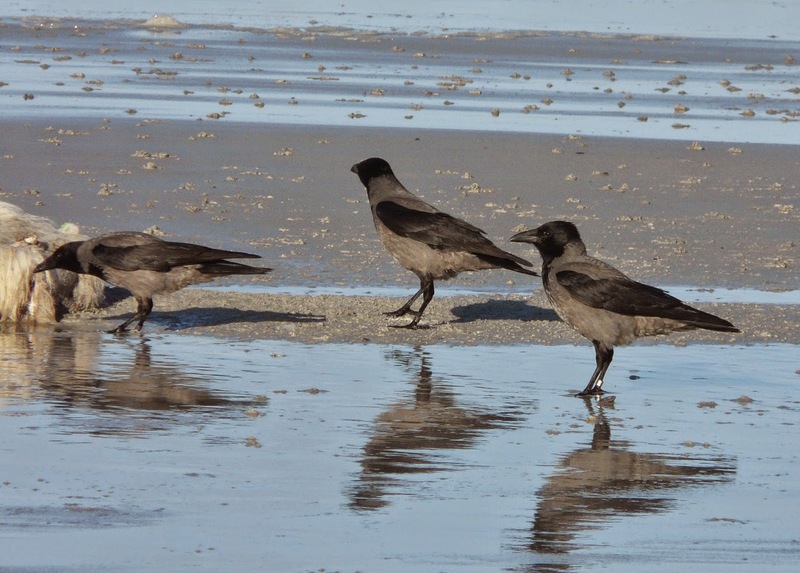 The wind however had changed to a south-easterly direction for the first time in a while and with heavy rain overnight, the trusted combination of nice day (14th) to get things moving, followed by south east wind and rain (15th) delivered a few unexpected early migrants to the island on the 16th. Unless you spend the winter in the Northern Isles there was nothing too exciting but the first Jack Snipe of the year, 2 Woodpigeons, a new Chaffinch, at least 2 new Song Thrushes, perhaps half a dozen new male Blackbirds and a 100 strong flock of Redwings (40) and Fieldfares (60) make for a reasonable days birding in mid-February. 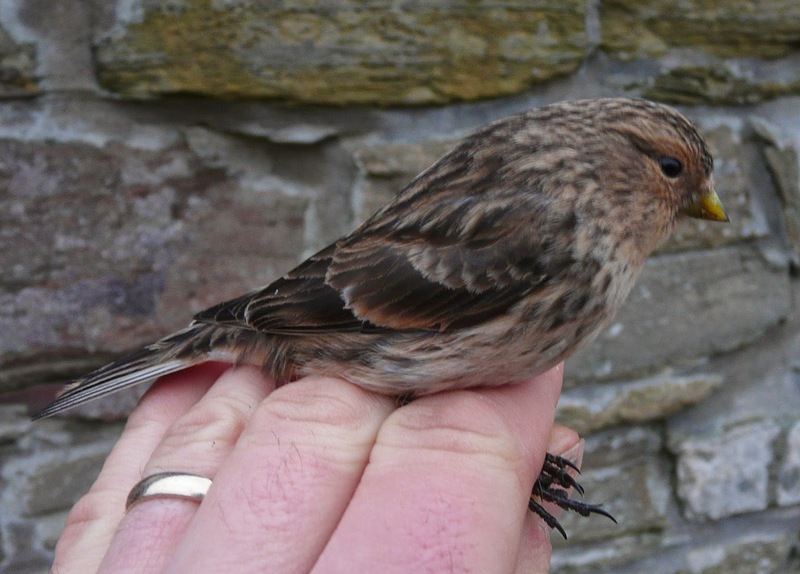 Twite numbers are also on the increase and the trapping of birds has revealed some turnover and the presence of returning individuals from past winters. The 2 single Tundra Bean Geese remain at Westness and Hooking respectively, as does the Green-winged Teal and the adult male Hen Harrier has also performed a couple of flypasts of the obs. A little bit of change the last few days with some spring like weather even encouraging a few birds to sing or display. Skylarks were heard in song on a glorious 11th and a couple were noted passing out to sea south-east on 13th so the signs that winter may be giving way are certainly there. There was also much excitement early on 12th when a Woodpigeon was seen outside the observatory and this was followed the next day by our second Brambling of the winter at Bridesness. The same 2 Glaucous Gulls continue to roam around the island while the drake Green-winged Teal remains and was even seen displaying among a group of half a dozen drake Teal on 11th!! Shelduck have built up to 6 and an influx of Waders to the wet fields at the south end of the island included 8 Knot, 68 Dunlin and 59 Ringed Plover with the Grey Plover also in attendance. Meanwhile, 43 Fieldfares and 20 Redwings were counted on 12th and 24 Twite included a dozen caught and ringed in the newest Heligoland trap. 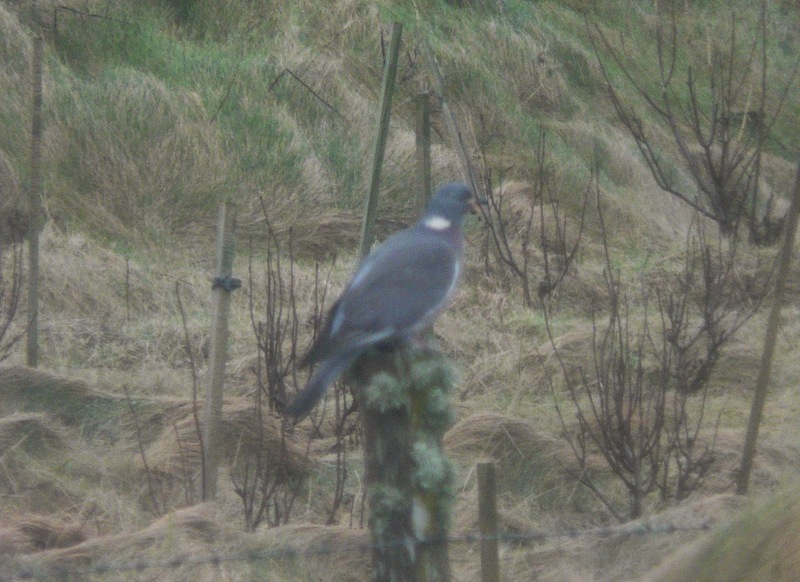 And a shocking photo through a dirty window of the Woodpigeon-but it was quite exciting!! Very little change so far this month, in what has been a fairly uneventful birding year...so far! Up to 2 juvenile Glaucous Gulls continue to roam around, both being seen on 10th on which date presumably the same Greenland White-fronted Goose was relocated near the Surgery. The Grey Plover was still with the Golden Plover flocks, but now at the south end it was joined by the first 2 Knot of the year on 8th-9th. The Wigeon x American Wigeon hybrid was again at Bridesness on 9th along with a couple of Shelducks while a count of 18 Goldeneyes together off Bewan on 10th was the highest for a number of years. At least 4 different Hen Harriers have been recorded but with no more than 2 on any given day and 44 Snow Buntings were logged on 10th. Well the weather has definitely improved, with the wind easing proving particularly welcome and there was even a bit of sunshine on 3rd. 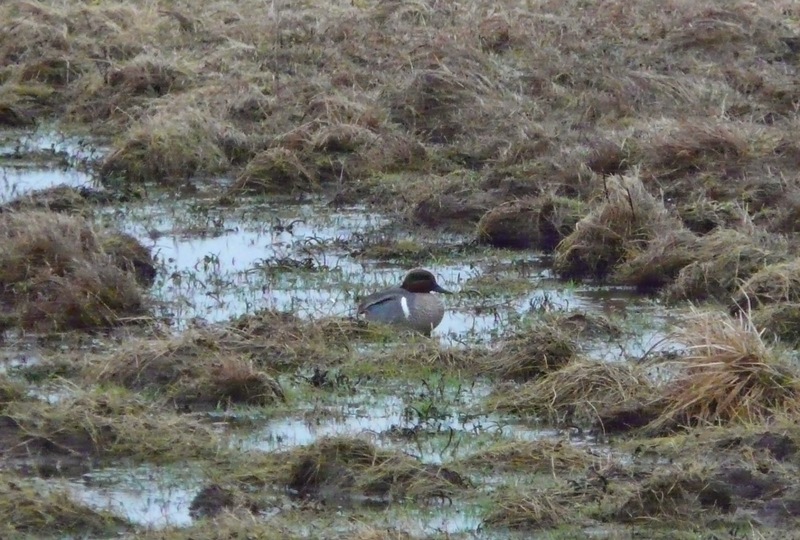 Lingering highlights were the drake Green-winged Teal at Bridesness (5th), the juvenile Glaucous Gull around the Observatory/Nouster (1st, 3rd and 5th), 2 different Tundra Bean Geese with singles still at Westness (3rd-4th) and the School (5th) and the Greenland White-fronted Goose near Greenwall (3rd and 5th). 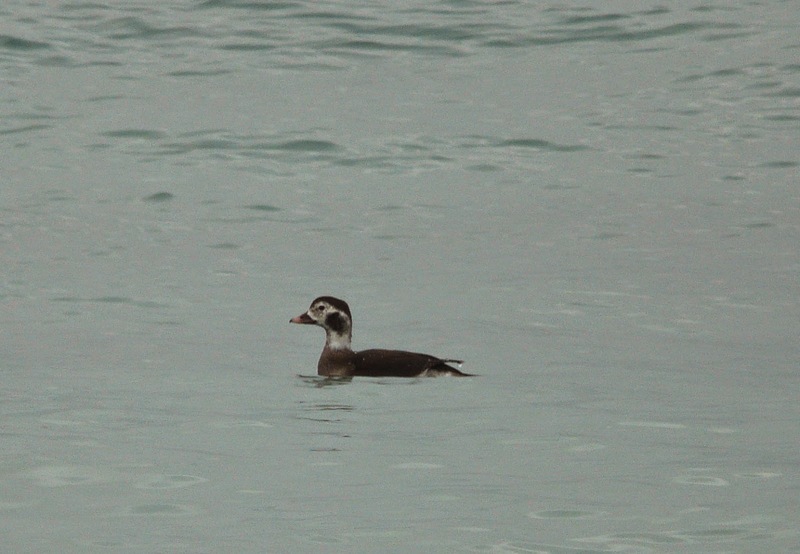 Calm sea's on the 5th allowed a good look around the south and east coast of the island and yielded a good winter total of 17 Great Northern Divers with 2 Red-throated Divers also seen and Black Guillemots much more evident with 36 offshore. The Wigeon x American Wigeon hybrid was off Bridesness again and other wildfowl tally's from that part of the island came to 247 Wigeon, 181 Teal, 45 Mallards, 12 Shovelers and the Pochard was seen again. 3 Whooper and 4 Mute Swans remain and raptors have been well represented with up to 3 Hen Harriers (including an adult male 3rd), a male Peregrine and 2 Merlins. Passerines remain few and far between but up to 40 each of Fieldfare and Redwings, the Chaffinch, Linnet and at least 16 Snow Buntings were all seen during the period.